“The last 3 years there has been a lot of turmoil, but now is the ideal time to invest and talk about business,” suggests Ishmael Asif, Vice President of the Maldives National Chamber of Commerce and Industries (MNCCI). In light of the upcoming Maldives Investment Forum (MIF) in Singapore, Asif told Minivan News that the Maldives can offer a secure political backdrop for any potential foreign investments. The forum – set to take place on Friday (April 25) at the Marina Bay Sands hotel in Singapore – will aim to increase the interest of Asia-region investors, and will be the first forum of such a scale to be hosted by the Maldives in another country. Ihavandhippolhu Integrated Development Project (iHavan) – This project aims to capitalise on the US$18 trillion worth of goods that pass through the channel to the north of the Maldives’ northernmost atoll each year. The project is set to include a transshipment port facility, airport development, a cruise hub, yacht marina, bunkering services, a dock yard, real estate, and conventional tourism developments. Citing growing east-west trade between China and India, the project also proposes to take advantage of more than 30 large cities which lie within a 4000km radius of the atoll. Moreover, the South Asian Free Trade Arrangement (SAFTA) means that export processing zones established in iHavan will enjoy duty free access to 1.7 billion people in the South Asian region. Expansion of Ibrahim Nasir International Airport (INIA) – Following the 2012 termination of the GMR concession agreement, the government is currently devising a new master plan for developing the country’s main international airport. Around forty percent of the tourism industry’s bed capacity is currently situated in the same atoll as the airport, with 80 percent of tourists taking less than one hour to reach their destination from INIA. Furthermore, the government plans to increase tourist arrivals to 5 million per year during its current term. “As such, the need to expand the airport’s capacity to cater to this additional demand and to provide value added commercial and high end retail services of highest international standards, is a key priority of the Government,” explains the forum’s website. Hulhumale’ Phase II Development – The next stage of the development in the Maldives “first fully reclaimed, pre-planned city” will involve further reclamation to the north of the island. Potential investors are being made aware of President Abdulla Yameen’s plans to develop the island into a ‘youth city’ with a population of 50,000, which will include a “technopolis park” to facilitate light industries. The construction of the long-awaited bridge between Malé and Hulhumalé is planned to further open up economic opportunities in the reclaimed island city. 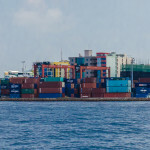 Relocation and expansion of the existing central port – Noting that the country’s major port in Malé has reached its capacity, the MIF will hope to attract investors to assist in the relocation of the main port to the nearby industrial island of Thilafushi. The project will include reclamation work on the island, the introduction of state-of-the-art facilities – including warehousing capacity, and marine harbour and support functions to cater to all types of vessel. Exploration for oil and gas – With oil imports accounting for 31 percent of the Maldives’ imports in 2012, the country is seeking to reduce reliance on foreign fuel with an oil and gas exploration projects, explains the event information. Previous attempts to locate economically viable reserves were unsuccessful, though the government wishes to find investors who can undertake more extensive surveys in the country’s territory. The proposed projects are due to be supported by the “relatively freer regulatory environment” provided by the special economic zones promised by the Yameen administration. Asif noted that the decision to hold the conference in Singapore sends a clear message to the international community that the Maldives is keen to discuss ideas with their potential partners, and to build bridges with countries they would like to work with in the future. The operator’s of Singapore’s Changi Airport met with President Yameen last week, sparking rumours that they would provide consulting services on the development of INIA. “Such a forum like this is organised to give a positive vibe, that we are open for foreign investment and willing to discuss [ideas],” he added. A host of countries have already expressed their interest and are registered for the Maldives Investment Forum, President’s Office Spokesperson Ibrahim Muaz confirmed today. President Yameen will be leaving tomorrow afternoon to attend the forum, where he will give the keynote speech to the more than 300 investors from 15 countries who have reportedly registered to participate. Following a presentation detailing the five projects, Tourism Minister and head of the cabinet’s Economic Council Ahmed Adeeb will give a speech, before a question and answer session regarding the proposed projects. President Yameen’s vision for foreign investment was spelled out recently, during the inauguration of a housing project in Hulhumalé – part of the ‘youth city’ project. “What we would like to confirm for the foreign investors who come to the Maldives is that foreign investors should feel that Maldives is your second home here,” said Yameen.